I have been wanting to make G a dress that combined crochet and fabric. I love crochet/knit dresses for her but if we are being honest here, I am wanted something faster because I can be lazy. I thought of making a formal pattern but 1) I didn't take super great notes when I was creating it and 2) I don't have the time to create a bunch in varying sizes. So consider this a semi-tutorial and do with it as you will. I used cotton yarn and cotton fabric. I think I used a size 5.5 mm/I hook - but the kids ran off with it so I can't confirm at the moment. Step 2: Create a chain as long as your measurement from Step 1 and then add an inch or two - depending on how loose you want it. Step 4: Decide where you want the button holes to be and then single crochet to that stop, chain 2, skip two stitches and continue. When you get to same spot on the opposite end, chain 2, skip two stitches and continue with single crochet to the end. Add another row or two of single crochet and bind off. Step 6: Sc2tog on the first two and last two stitches of each row. This will create the taper. Repeat this until you have the top to your desired width. I then added two more rows of single crochet. Bind off. Step 7: I used a contrasting color and picked up stitches along the edge. I just used a simple single crochet edge. Bind off. There the crochet part is finished! My sewing skills are pretty basic so I needed something simple. Shall we carry-on?? Step 8: I took one yard of fabric and cut it half (selvage to selvage). Create your hem, I added some fancy-shamancy stitches just so I could test out my new machine. Step 9: Using my ruffler foot (or a gathering technique) I created a gather along the top edge. I then went along the top with my pinking shears to prevent fraying. Step 10: Sew the top of the skirt to the bottom of the crocheted bodice using a straight stitch on my machine. I just laid the bodice on top of the fabric and pinned - not right sides together like you would normally do with sewing. Sew up the back seam until you reach the bodice. Sew up the bodice using your preferred method, I used a slip stitch. Weave in ends. Step 11: To create the straps I made double-fold bias tape and top stitched around. To get the length I measured G from the top of the apron to where the button holes are. I wish I had then added two inches so I could add more buttons as she grows, but that is for next time. I then sewed those to the crocheted bodice. Step 13: Step back and admire your hard work. 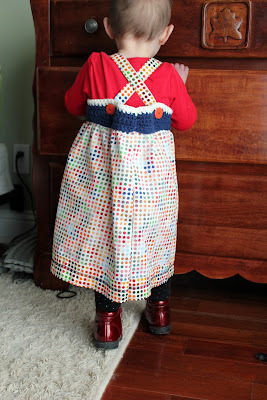 I am hoping that G can get two years out of this dress since I made it with crisscrossed straps. If you have any questions let me know. I know this wasn't the greatest tutorial but consider it a chance to break out your artist license. Perfectly Paired by Sarah Boccolucci is licensed under a Creative Commons Attribution-NoDerivs 3.0 Unported License. Please do not use my images to sell product in your shop. The images in your shop should reflect your own work and not the work of others! I also ask that if you do sell these in your shop that you link back to this page out of courtesy for using a free pattern. 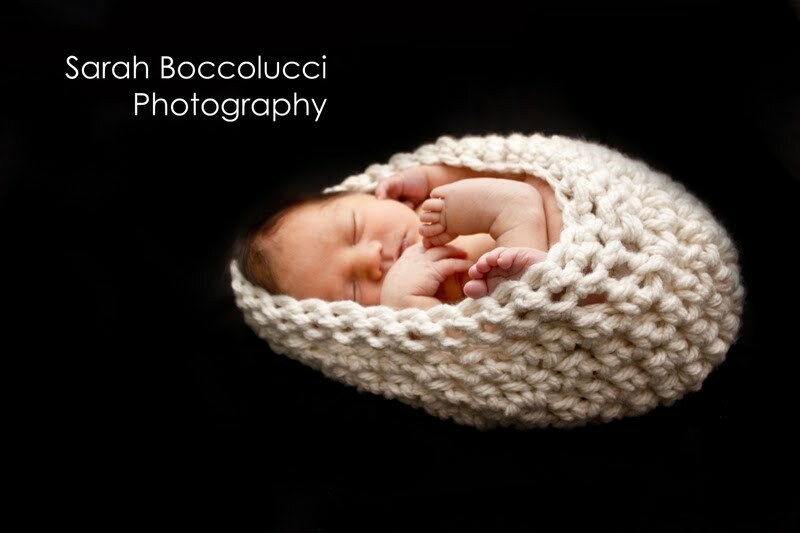 If you are interested in purchasing a completed cocoon let me know. For $30 I will create one in the color of your choice. I updated how the pattern was written on April 4th, 2011 to hopefully make it easier. If you have any questions be sure to either email me or let me know how to contact you in the comments section. This pattern is worked continuously, without a seam. Finished size - 12 inch opening, about 9 inches deep. The baby in the picture weighed about 8 lbs and was 18.5 long. Hopefully this goes without saying, but please don't leave baby in the cocoon unattended. In the pictures I then switched to single crochet for 2 rounds which makes it possible to thread a ribbon and change the look easily. If you don't have a newborn handy you might want to leave a long tail and add more if you want more coverage around the baby. I did that and I was able to add the last two rounds in about a minute. Bind off and weave in ends. COMING SOON! 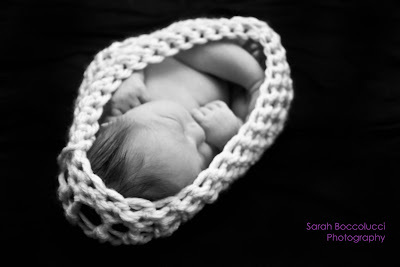 - I am planning on creating the same cocoon using fingerling or lace weight for an airier version. If you are interested in selling these beauties consider making a donation. Half the donations from this pattern will go to St. Jude's Research Hospital. 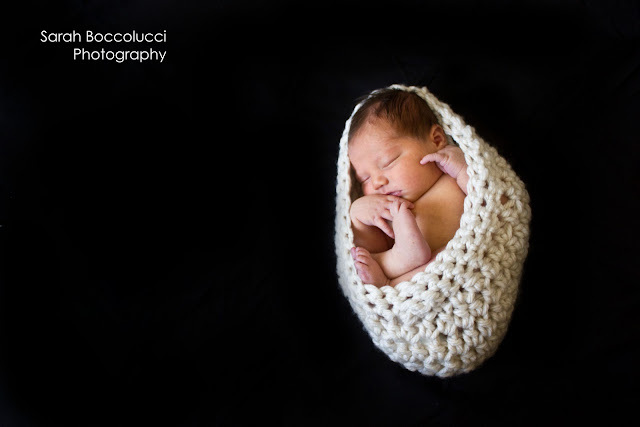 Baby Cocoon by Sarah Boccolucci is licensed under a Creative Commons Attribution-NonCommercial-NoDerivs 3.0 Unported License. Based on a work at totsandbottoms.blogspot.com. Grandpa has a burgundy 1957 Chevy that Little Man loves. 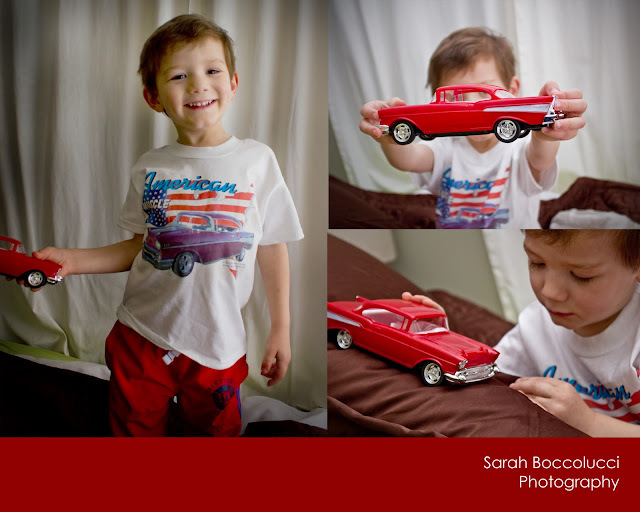 Grandpa sent M a shirt with a hot rod and for Christmas they put together a model. On a random side note - I was able to download the DNG converter for Photoshop and can now access RAW files. I wasn't sure how big a difference it would make but now I am a believer. Now I have to go get some bigger memory cards. I know I am a little late on this post seeing as March is half over. I said one photo for each day, not timely posting of said photographs. Yesterday I sewed this cute little chick I created in Photoshop. Applique takes patience, which I am slightly lacking in, so they are good projects for me to better my sewing skills. Click here if you want to download the line art for this applique. I simplified the feet in the version I sewed but just cut that freehand. While going through my favorite pile of scrap fabric Little Man took a piece of fabric and tucked it in his shirt and told me it was his tie. I am not sure where he got this idea since I can count on one finger how many times his dad has wore a tie since he was born. He even wanted to wear it to bed. I decided to let him pick out some fabric to make and applique tie. He went straight for the dragon and never veered from his choice. Trying to get the whole dragon in the tie wasn't that easy but he is a happy customer and insisted on wearing the shirt immediately. No pattern - I just drew it out on the heat and bond and then did a satin stitch around the edge. I little messy but acceptable to wear out in public. I got an hankering (yes, a hankering) for my Grandma's molasses popcorn balls last week. Seeing as she lives 1400 miles away I knew I would have to take things into my own hands. Using a recipe I found online that had all the same ingredients as her recipe Little Man and I wiped up a double batch in no time flat. Why make one batch when you can make two? Dump popcorn on a table or counter. Fluff the popcorn to make the hard unpopped kernels fall to the bottom. This is a great step for kids to help. This is how much we had after popping one cup of popcorn. Add the rest of the ingredients, minus the baking soda to large sauce pan. Do not stir - not sure why, but it said not to. Bring mixture to 235 degrees or soft-ball stage. Soft-ball is when you place a small amount in a cold cup of water and you can roll it into a smooshy ball in between your fingers. Add the baking soda and watch your mixture double or triple in size and turn a lighter color. Pour over popcorn and stir. Wet your hands with cold water and form into ball. Repeat, repeat, repeat. Place in plastic bags to store. I am not sure how long they keep because I ate them all in a couple days. My husband isn't a big fan or molasses, Little Man didn't like to be sticky and Baby Girl like them but I was afraid of her choking so she only had tiny pieces. Sooooo maybe I didn't need to make a double batch... Who am I kidding, I love them and feel no guilt that I ate them ALL (diabolical laugh), minus the three I mailed to my Grandma. Find all the books, read about the author, and more. (Author) and Henry Cole (Illustrator). 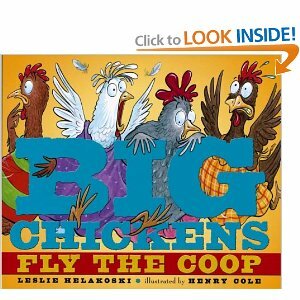 Each page starts with "Four big chickens..." He picked that name Four first and then I guess he figured Three was the next obvious choice. Here he is reading that book to Three and Four. Here is Baby Girl just hanging out with the latest additions. After many phone calls to the local farm store this weekend we finally got our chicks this morning. I called them at 9:05 this morning and got there around 10:00 armed with my list of the breeds I wanted to get. When I called the store they said they have about 10-15 chicks left of each of those breeds, but little did I know the elderly Korean couple in front of me was going to buy EVERY SINGLE CHICK in the breeds I had decided on. Seriously, what are you going to do with 60 chicks?? Don't people that buy that many get them in the mail? After pleading the sales man to ask them if we could have one New Hampshire Red and one Araucana he said they don't speak any English. First come, first serve is fair but I feel like to get the chicks you want (in small quantities) you have to camp outside the store. Now I am thinking, "Crap, I can't bring a three year old and tell him we are buying chicken, show him the chickens and then have to explain that he has to wait a week to (maybe) get the chickens we want." On to plan B... call up Hilary and make her Google search the remaining breeds to see if they are a match. Unfortunately, I get her on the phone and can't articulate what characteristics I am looking for and she is just reading off a bunch of random notes about the breeds. I am sure at this point the sales man is thinking, "Is this lady for real? Real farmers don't need Google and cell phones to pick out their chickens." Maybe he is right, but we aren't real farmers, we are just backyard chicken enthusiasts that were 5 minutes too late getting there because I just had to take a shower. With all my research out the door and pleading looks to the elderly Korean couple to please leave some for the rest of us we purchased our two newest chicks. Thanks Hilary for being able to get me the info I want (cold hardy and good egg layers) even though I couldn't speak concisely on the phone. Without further ado please meet Three and Four (M named them). Campine is an older European breed that is a descendant of the Kempishe Brakel. They are named Campine because they originated in the north east area of Begium called Campine. People in that region say the Campine has been around since the time of the Roman cesears. The Australorp Breed was developed in Australia at the end of the nineteenth century with Black Orpington stock from England. 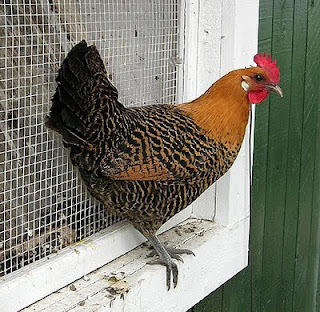 The breed also has genes from Rhode Island Red, White Leghorn, Langshan and Minorca crosses. The purpose of the breed was as a “utility” chicken for both high egg production and meat. It was originally known as the Black Utility Orpingtons. The breed was standardized after World War One and admitted to the Standard of Perfection in 1929 in England under the fitting name Australorp. By the end of World War Two, Australian poultry breeders wrote up their own breed standards, which have been accepted worldwide. Historically, Australorps have been egg-laying champions: an Australorp hen once laid 364 eggs in 365 days. They are an exceptionally beautiful bird, quite big, with black glossy feathers that have a green sheen and huge black soulful eyes. They are friendly, quiet and very good egg layers, laying as many as 300 eggs a year. They do well with other breeds and weather the winter months well. Here is what they will look like when they mature. You are welcome to use pictures from my site but please give credit where credit is due. Please do not repost any of my tutorials or patterns on your site, use a link back here. Please and thanks.